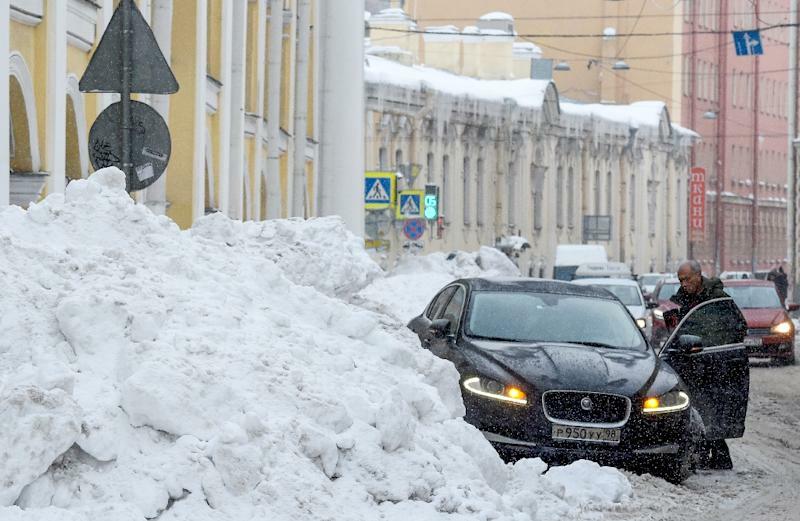 Saint Petersburg (AFP) - Lawmakers in Russia's second city Saint Petersburg have called for a state of emergency after heavier than usual snowfall caused treacherous conditions and a man died when he was hit by a block of falling ice. The group of local lawmakers has petitioned the city's governor to declare a state of emergency, accusing authorities of failing to deal with the problem and even asking the military to intervene. "It's a complicated situation. Snow is falling daily. We see there is tension among the residents but we are working, we are doing everything possible," city official Sergei Sharlayev told journalists. On Tuesday, a 23-year-old man was killed in the city centre when he was hit by a large piece of ice that fell from the roof of a building. Investigators have launched a criminal probe. "The city has turned into a giant snowdrift," said local resident Yelena Antonova, 43. Like thousands of others living in the city, she takes a shovel with her every day to dig out her car. "I take almost two hours to get to work instead of the usual 40 minutes, it's chaos on the roads," she said. "I have not been out of my house for two weeks, I'm afraid of falling on the frozen pavements," said Marina Shibalova, 78. Officials now say they have tasked over 7,500 people and 7,000 vehicles with clearing the snow.